Since I can remember, I have always been involved with the protection of wildlife and the habitat that supports it. I’ve seen some terrible things and I’ve fought some horrible fights. Everything from working with the Sea Shepherd Conservation Society to ‘after dark’ animal rescues has been part of my world. 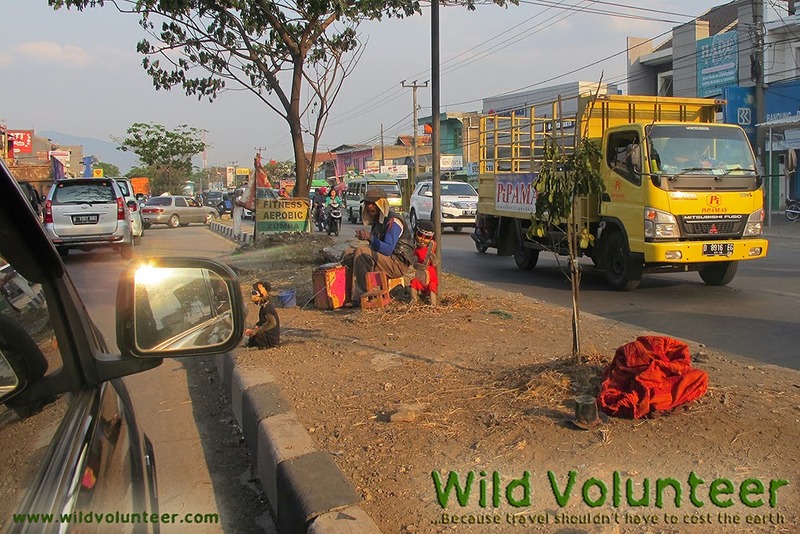 More recently however, I have been volunteering in West Java, Indonesia. As part of my role I was responsible for gathering data on the atrocious wildlife markets. In the larger cities here, including Jakarta and Bandung, every animal you can imagine is for sale; otters, porcupines and the ‘protected by law’ critically endangered slow lorises are just three species I see on a regular basis. Two porcupines ‘protected by law’ have been in separate cages for more than four months. It seems that porcupines are not cute enough to keep as pets, so rather than return them to the place where they were stolen from, they suffer day in day out in a cage that is barely big enough to allow them to turn around in and of course, without any form of enrichment. This is by no means the worst thing to witness, so I carry on, collect the information and inform the ‘authorities’ when I identify protected species for sale. I sometimes feel that my efforts are in vain, as the wildlife continues to be offered for sale in hot, dusty, sometimes humid and extremely unsanitary, cramped conditions. I often wonder ‘why do I bother?’, but I’m resilient remember, and I must continue on. The situation for so many lives is so very sad, but my heartbreak was still to come. After leaving the markets I drove along a busy road between two cities, Bandung and Garut. It was a Saturday in October and the traffic was loud and backed up for miles; taking around one hour to drive 7km. Three lanes in each direction; car and motorbike horns constantly tooting on top of loud music blaring from the surrounding vehicles - The worst 7km I have even driven! I could hear out-of time-drumming, very loud drumming combined with cymbals clanging. On the median strip between the two directions of traffic, were elderly people sitting on pieces of dirty cardboard begging for money. A blind women cradling a baby in her arms begged incessantly for more money hoping to appeal to the compassion of a sympathetic passer-by. In amongst the frenzied mayhem, I witnessed something that would etch into my memory and stay with me. The drumming and cymbal clanging that I could hear was the ‘topeng monyet’ or dancing monkeys. This incredibly cruel and disturbing form of local entertainment was something that I had heard about, but had never witnessed with my own eyes. 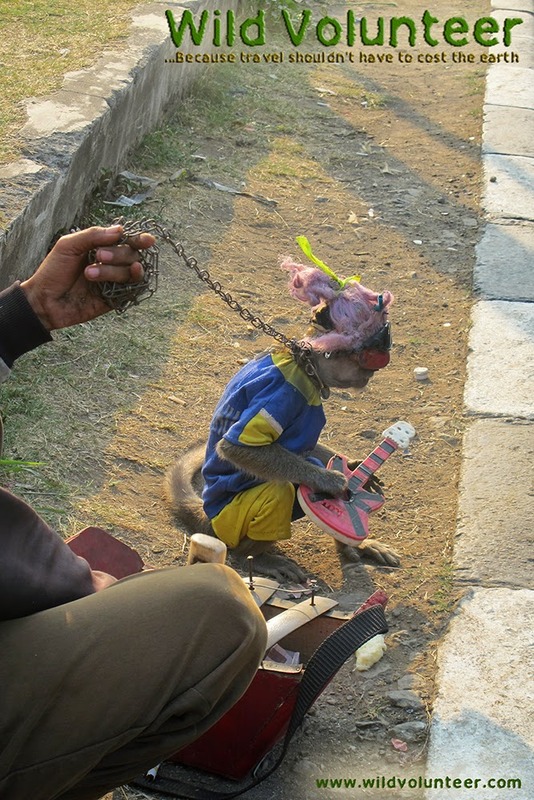 Each monkey that is forced to perform is, over many months, brutally tortured into submission and forced to stand up on its hind legs to dance, all while dressed in humiliating clothing accompanied by a mask or dolls head while the cruel owner bangs a small drum and cymbal. I believe this was not the intended life for any species on earth. 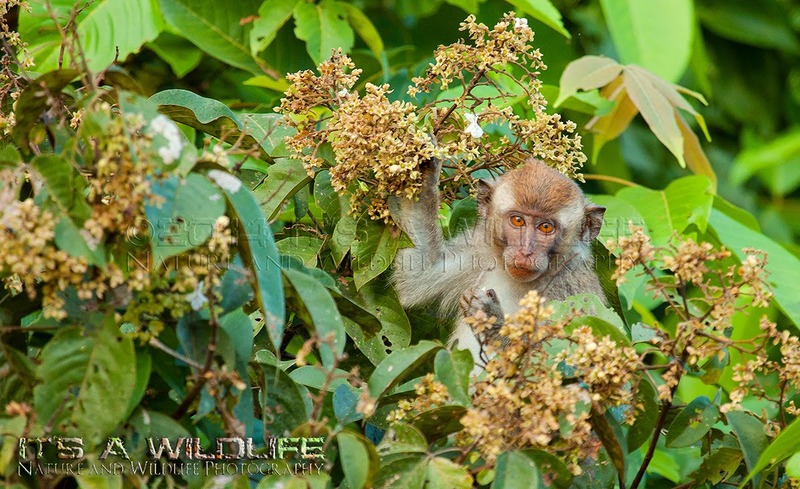 The primates that are used in this ritual are macaques and are often stolen from the wild. Until a recent trip to Borneo, I had never even seen them before. I watched juvenile macaques shackled by a chain wrapped around their neck, being forced to dance around in between the stationary vehicles begging for money. From my car a very small macaque was chastised for ‘misbehaving’. This ‘misbehaving’ of course, was something as innocent as taking his mask off which, considering constantly dancing during the heat of the day that it could be expected. As a result of the macaque’s disobedience, a hard tug on the chain triggered a high-pitched scream from the little macaque that could be easily heard over the unbearable traffic noise. The traffic jams (marcet) that are incredibly common throughout Indonesia are loud and extremely chaotic at best, but all of this coupled with the unnatural duty of being forced to perform and the relentless brutality dealt out by the macaque’s uncaring owners could only be interpreted as hell on earth for this peaceful creature. Here are some photos we took from the car as we went past. (Thanks for your help Katy and Rebecca). We saw six monkeys performing on the median strip that day and it eventually it took a toll on me, as I could only sit and cry – helpless to the fact I could do nothing to end their suffering at the hands of my very own species. I must confess, with all of the injustices I have witnessed, handed out to animals by uncaring and cruel human beings, it has been a long time since I have felt this way. This was the day my heart truly broke and I’m not sure it will ever be the same again. Even writing this I choke up. How could this ever be fair for them? Another sad part of this story, that really does sum up the people who support this cruel industry, is that the ‘monkey torturers’ were being thrown money from almost every single car in that traffic jam. So I ask, what about the blind woman with the baby? Well, I can tell you, for the entire time we were in that specific traffic jam, the woman cradling the child never received one coin – I guess she wasn't entertaining enough. It is illegal to showcase ‘topeng monyet’ in the city of Jakarta, but elsewhere in Java it seems to be an accepted practice. Although there are organisations fighting very hard to stop this atrocious practice, the profiteers just pack up and move on to the next place. If you travel to Indonesia or any other part of the world, I just ask that you never support this cruel and torturous exploitation. 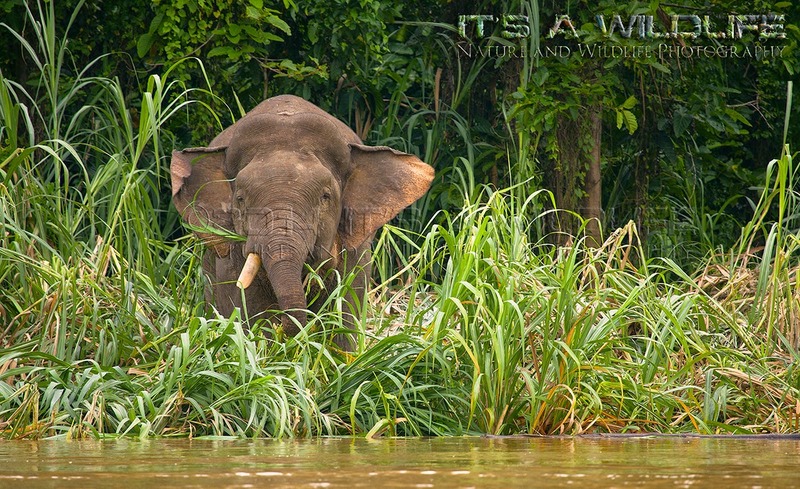 Like many people that travel for wildlife experiences, Borneo has been on my wildlife ‘must do’ list for many years. However, I have put it off to venture elsewhere and only now am I getting back to re-arranging my highest travel priorities. As many of you know, my husband Michael and I have been volunteering at Little Fireface Project in West Java, Indonesia since mid-December 2013. With an intended stay of just two months, we have now passed the 10 month point with no solid finishing date considered. So, how did we end up in Borneo? As amazing as West Java is, obtaining Visas to stay in Indonesia is a serious pain in the backside to put it mildly! To renew a travel visa for Indonesia, a departure outside of the archipelago of Indonesia is required so; every 2-3 months off we would go to nearby Kuala Lumpur in Malaysia. Only a short 1 ½ hour flight from Bandung our nearest International airport, Kuala Lumpur is a great destination for a visa renewal with easy access to the island of Borneo. As Borneo is divided into two states, Sabah which is Malaysian and Kalimantan which is an Indonesia held state, we of course could only visit the Malaysian side. We renewed our visa at the Indonesian embassy in KL and we headed off landing at Sandakan airport in Sabah. It is worthy to note at this point, that if you intend on travelling to the island of Borneo you cannot fly into the state of Borneo from Malaysia or Indonesia without your passport. You MUST have a stamp of arrival into Malaysia or Indonesia, even though the state of Sabah is part of Malaysia and the state of Kalimantan is part of Indonesia and are in essence, domestic flights. BATUH PUTIH OR BATUH PUTEH? From the airport we were told to travel by bus to ‘Batu Putih’. The trip then should take around 2 ½ hours and stop near the community centre jetty, where we would catch our boat down river to Danau Girang Field Centre. 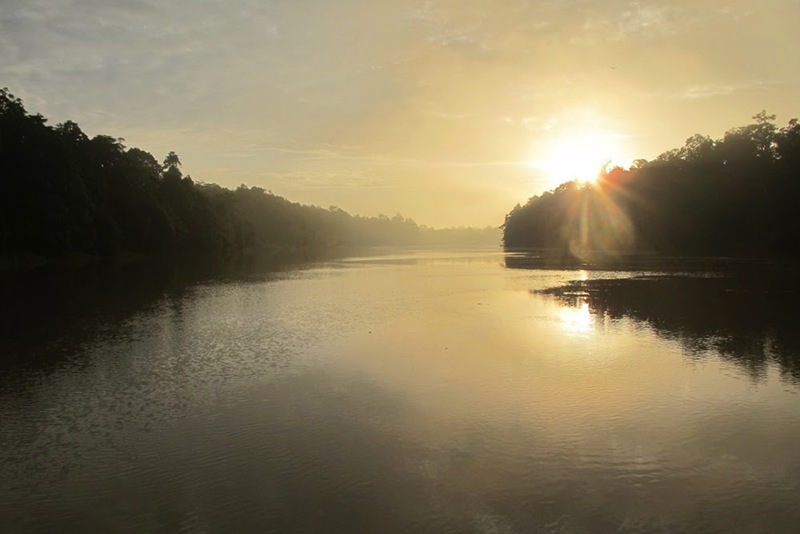 A highly regarded field station, Danau Girang had been one of those organisations we have admired for a very long time; following all of their ‘direct action’ pursuits via Facebook and of course, their website. Well, the directions didn’t make much sense after a while when the bus we were advised to board took just ten minutes to arrive at the end of the line in the small village of ‘Batuh Putih’. Once there we were on the banks of a river with some chickens, goats and children wandering the dirt tracks and playing in the main street. It was ‘Batu Putih’ alright, just the wrong one! I had spelt it wrong... You really can’t believe I have travelled the world on my own for more than 25 years can you? It wasn’t long before a teenage girl, Indi, come wandering from her small wooden home saying hello with rather respectable English. We explained in very basic Bahasa Indonesian (understood in Malaysia, as the two languages are very close) that we thought we were in the wrong place and after checking google (yes, it is everywhere), we found that in fact, we were looking for Batu Puteh 2 ½ hours down the road. 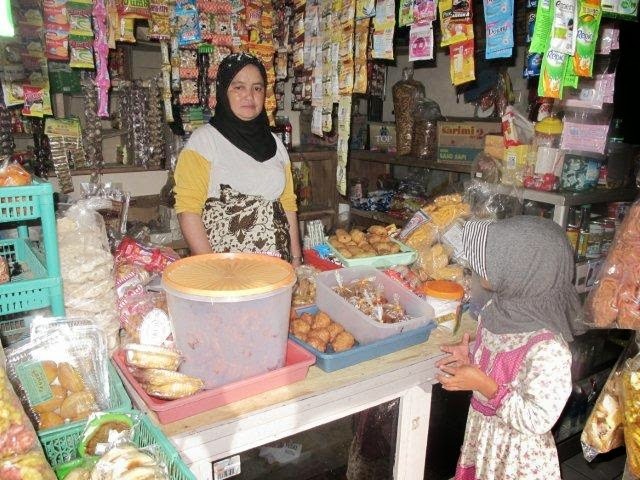 We stopped and chatted for a while and enjoyed some delicious nut biscuits and a cold drink on the verandah of her families nearby home. Indi’s dad offered to drive us to our correct destination after he had a shower of course – as you do! As it turns out, catching the bus to the wrong place turned out to be a wonderful wrong turn, as wrong turns often are! I have often heard of the devastating effects Palm Oil plantations have had and continue to have on the Borneo landscape and I can tell you now, none of the reports from here have been exaggerated. Driving between Sandakan and Batu Puteh, Palm Oil plantations stretch for as far as the eye can see. I liken it to driving in Western Victoria, Australia, where everything has been logged for a variety of purposes including livestock and crop farming. DEVASTATING! So we finally reached our jetty on the Kalimantan River 2 ½ hours by bus from Sandakan Airport and met Danau Girangs’s local manager, Budin, and the small boat that would take us down stream to the field station. A wonderful 45 minute boat ride at fast speed down the relentless rain swollen river system and there we were … Heaven on Research Earth! We met up with Danica Stark who is currently working on her PhD on Proboscis monkeys. Danica settled us in and after unpacking, we slowly wandered down the main path through the grounds of the field station. Beautiful lush rainforest met the edges of the path on both sides with the fresh air audibly scented with the melodic calls from a variety of bird species. Danau Girang is the perfect set-up; happy volunteers, students and staff, working together toward serious conservation goals and doing it very, very well. Danica collected us at five ‘o’ clock and took us back out on the river. She had enquired earlier as to our interest in joining her whilst she collected data from radio-collared proboscis monkeys. A short ride further downstream, all the while scanning the surrounding forest with a radio antenna, Danica soon yelled out to our driver and we came to a slow stop. Whilst Danica picked up another strange-looking piece of equipment and plugged the antenna into it, she began to explain to us that she was downloading behavioural data from the collared individuals via satellite. “You might see a proboscis monkey while we are sitting here” Danica also remarked to us. 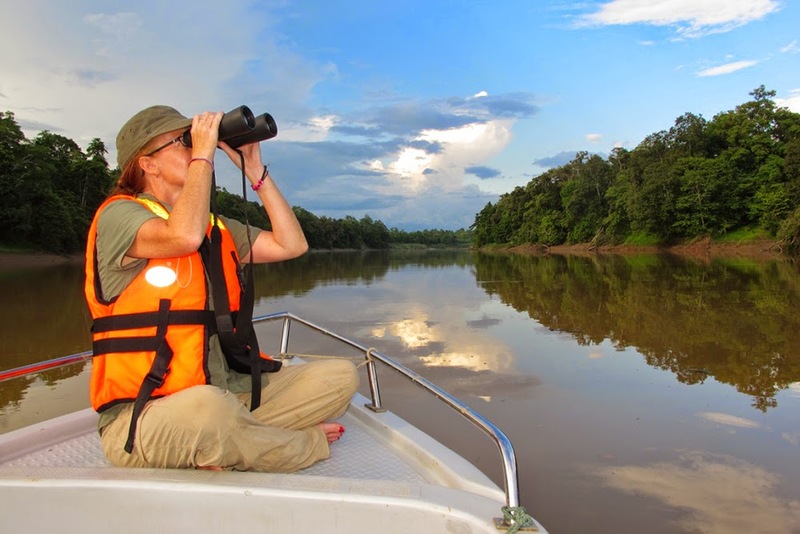 No we actually didn’t see a proboscis monkey… we saw at least 12! There they were, hanging from the trees and generally living life to the full. The males are extraordinary to look at, with the main upperparts of the animal resembling a little ginger waistcoat and a little white shaved bum that would have you believe you caught him in the middle of getting dressed. It is as if they were constructed by their makers very purposefully; every single hair having a specific place and colour. The females are very petite with the males sporting one of the biggest noses you have ever seen on an animal - Mother Nature take a bow. Continuing slowly, further downstream there came a familiar sound heard just above the boats outboard motor. An uproar now, just ahead, coming from the forest edge... loud crashing and, wait … NO WAY… trumpeting! 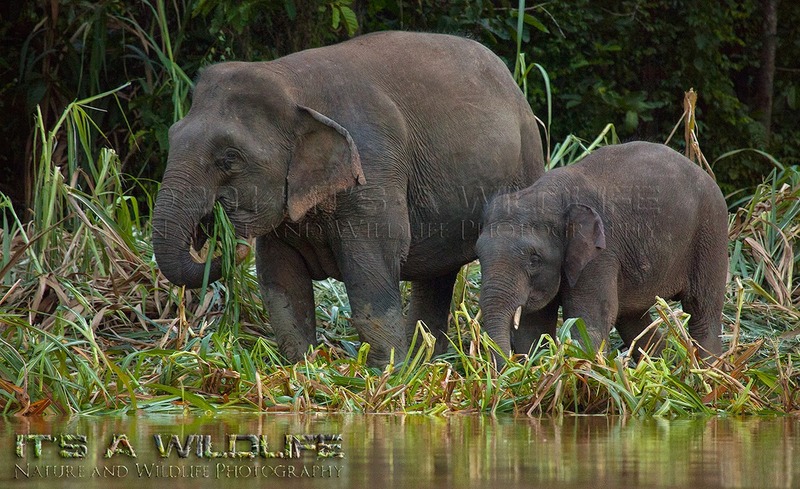 There they were, one of Borneo’s most endangered mammals - Borneon pygmy elephants (Elephas maximus borneensis). On the bank of the river in amongst the thickets of tall grasses, at least nine individuals were playing in the water with another four individuals, including the alpha male enjoying the warm glow of the afternoons setting sun. What an amazing sight! The elephants move up and down the river system in accordance with the seasons, so we were very fortunate to see them during our brief stay. Approaching a regulated safe distance (more so for the now uninterrupted conversations of the herd could be enjoyed reduction of stresses to the animals), the boat’s engine was silenced. Now drifting with the rivers current, the Elephant’s trumpeting and crashing was like an elephant symphony, a symphony we had front row seats for. That evening after some delicious food supplied by the centre, we ventured out into the surrounding forest in search of the elusive and much endangered Slow Loris, but unfortunately, we never did get to see any. 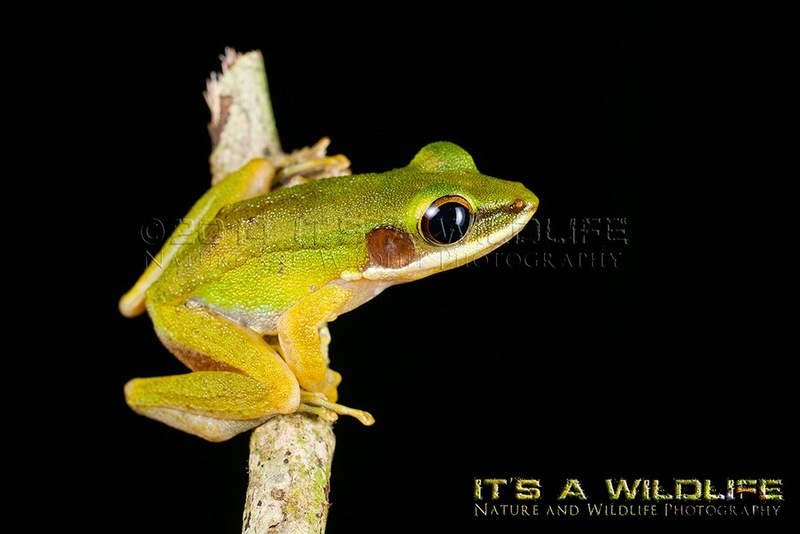 However, we were rewarded with and abundance of frogs and creepy-crawlies and as frog loving people, Michael and I took full advantage of the situation which made for a thoroughly enjoyable experience with some great photographs taken of the willing subjects. After a rather restless night being entertained by a native forest rat that had wandered in to our room to inspect his latest tenants and to hopefully grab a free snack, early that morning we went out exploring throughout the various walking paths that wind their way around the field centre. It is just that sort of place, you always see something. 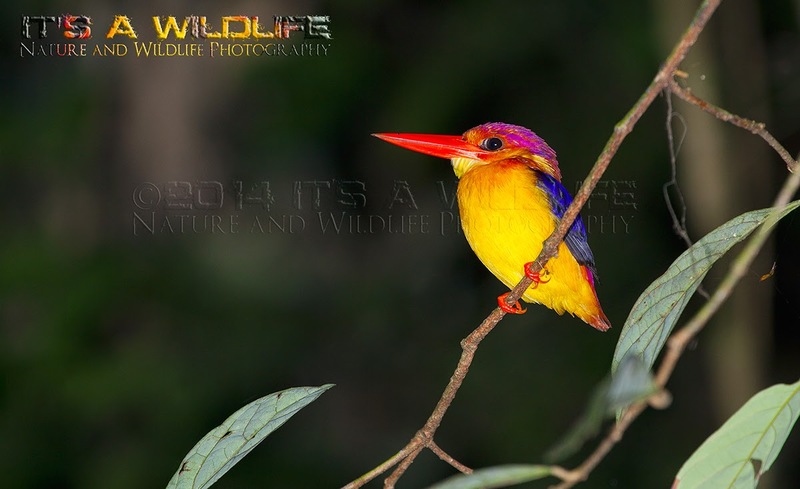 Birds, which included the beautiful and highly sort after hornbills which are on the list of any wildlife nut, squirrels, macaques, short-tailed mongoose and a colour palette of butterflies all enriched our morning stroll. Then sadly, due to having commitments at Tungog Rainforest Eco Camp further up-stream, our trip to Danau had come to a rather enjoyable end. The ever so organised Danica sent us on our way in the small boat to out next stop, just 30 minutes away by boat. 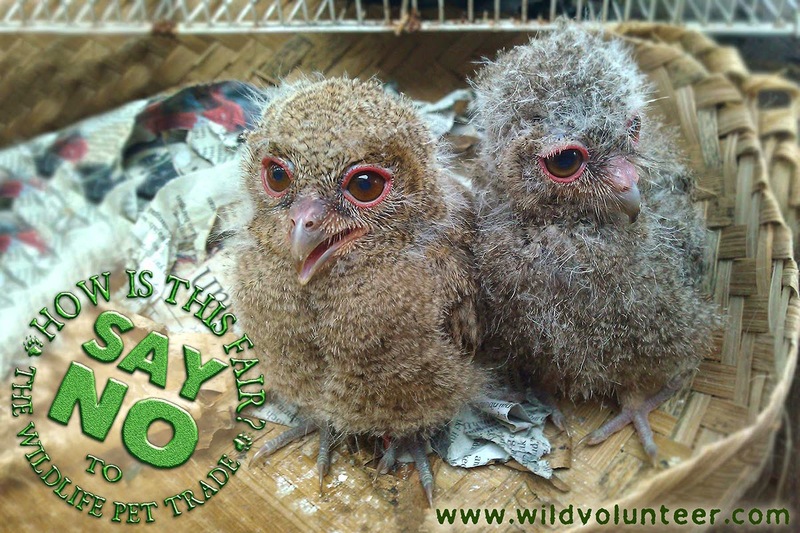 Please visit Danau Girang Field Centre and experience and support the wonderful work they do. If you are interested in volunteering at Danau, I can highly recommend it for your placement year if you are studying conservation/biology at University. Tungog Rainforest Eco Camp, this is where our short wildlife holiday would begin, no work talk, no research, just wildlife... lots and lots of wildlife! T.R.E.C. is part of a community cooperative called MESCOT. We checked in at the community centre where we were warmly greeted by the locals. Prior to your stay with MESCOT, you pre-arrange your tour schedule with the lovely Zazarita. This includes; day and night time guided walks and morning, evening and night boat cruises down the river system. This way of pre-booking the activities offered, which is still flexible and can be changed according to your developing needs, is a great way to fit everything in and allows the staff to organise their schedules also. So, at any one of MESCOT’S camps, you can be as organised or as relaxed as you want – it is of course, totally up to you. We opted for a morning and evening cruise each day of our stay with nocturnal walks each night (guided at all times to maximise safety) and apart from the first two days where we had our guide show us the lay-of-the-land, we would just wander ourselves during the day. The eco-camp is basic, but I must confess, it is in my Top 5 wildlife accommodation hotspots...so far. 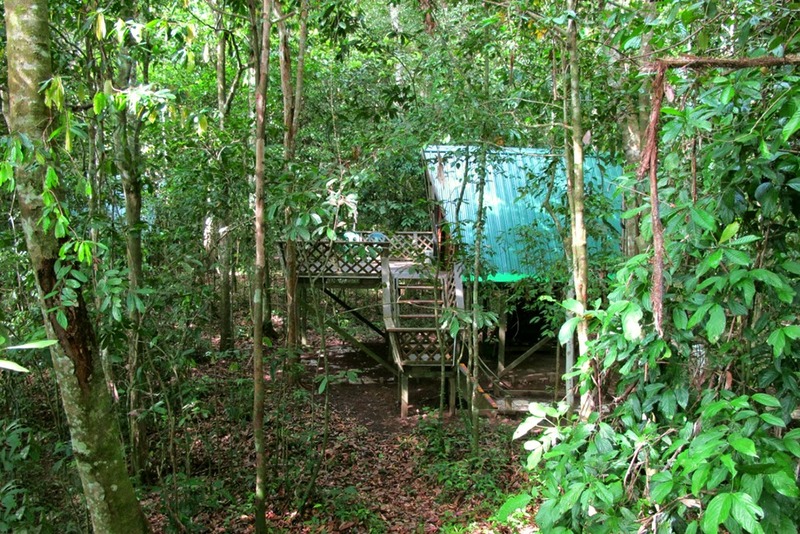 Your personal accommodation is in the form of a stilt-type dwelling with a stair case leading to your large verandah or wildlife watching platform. Without walls, the sleeping quarters are dictated to by the dwelling’s A-frame construction. With two single Japanese-style futon beds inside equipped with mosquito nets that totally enclose you as they tuck under the bed’s frame you can be assured of a peaceful nights sleep. Our accommodation was facing towards the camp’s large lake approximately four meters from the water’s edge. There are 10 accommodation dwellings in total, so the camp is never what you would call ‘crowded’. In fact, we were lucky enough to have the whole camp to ourselves. A large group had departed the morning we arrived so, other than the pleasant and tentative staff, it was just us! Ali the Eco Camp’s manager always hooked us up with filter coffee throughout the day which was an unexpected luxury that was thoroughly appreciated. During your stay at the Eco Camp, you are provided three meals a day which are delivered by boat from the community centre. The meals were basic, but delicious and nutritious. We are strict vegan and to our surprise all attempts were made by staff and they catered incredibly well. Just like any other destination you intend on visiting, it is important you relay all of your dietary requirements as soon as possible and as Tungog is accessed only by boat it is equally important that all of your health needs be sufficiently addressed – Don’t get caught out! The communal amenities such as shared bathroom facilities are cleaned and maintained daily and as a result, are kept in perfect condition. Ambient temperature (same as the outside temperature), traditional ‘ladle’ showers and sit down flushing toilets, as well as Asian squat toilets on are available to you at Tungog. After enjoying several evening and morning cruises and many walks through the rainforest, our wildlife list just grew and grew with no effort at all. From our balcony in the day macaques would parade past, giant and pygmy squirrels would just hang out on the trees with birds from an array of species would fly into the surrounding trees and just sit in front of us; equally interested in us as we were of them. Throughout our various trips up and down river by boat and even whilst enjoying breakfast at the Eco Camp’s extensive dining area, we managed to view five of the eight species of hornbill. The dining areas large exterior timber decking that tears down a further two times to the water’s edge, is complete with tree trunk seating and is the perfect space to spend a few hours just hanging out (with a pair of binoculars and a camera) just watching the day roll past with a slice of cake and a cup of that coffee I spoke about earlier. Small-clawed otters play in the cool waters while just on the other side of the lake you may just enjoy the antics of long-tailed macaques and proboscis monkeys; something I never thought I would ever experience over a casual coffee near a lake. The density of wildlife species, no matter what you are after, is truly remarkable. I was greatly rewarded whilst on our second nocturnal walk, with a really great sighting of the elusive ‘Moonrat’; the only species of Asian rodent that is pure white. Wow, could this place get any better? Well, yes it can and it did! 19 species of mammal; countless species of birds and other encounters such as frogs, geckos, scorpions, butterflies, snails and other things we had never seen before in our lives. I think I am missing something though... now, what is it? 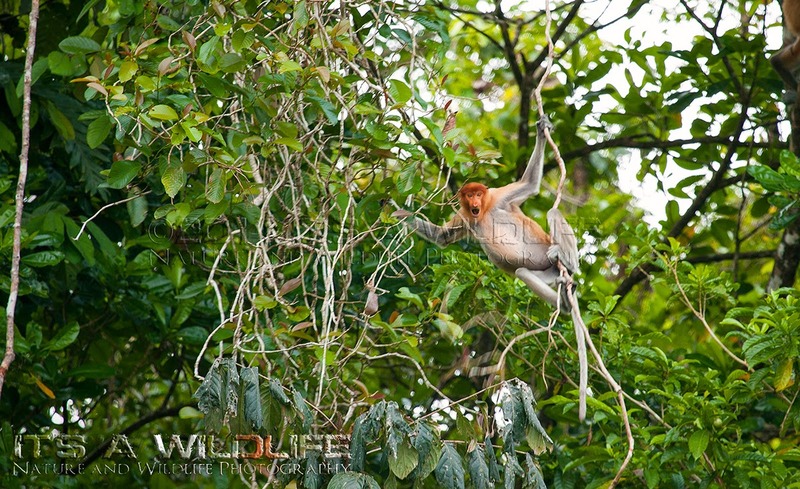 Oh yeah an orang-utan (Orang – People and Hutan – Forest: meaning forest people)! On our very last evening cruise, we had it in our heads that this would be the last chance we would get to see an Orangutan in the wild, which had previously eluded us. I must confess however, that I am one of those people that thought I wouldn’t be fussed if I didn’t see one; I WAS FUSSED, I WAS FUSSED! And at this point, I was getting rather disappointed, as well as being told we could see them quite easily, I couldn’t now return home from Borneo and say I didn’t see one, could I? I was surprisingly a bit disappointed. So, after our boat returned to our camp without the joyous laughter and banter that usually comes with sighting such wildlife, we wandered slowly up the walkway to the main dining area. (Prince) Ali our camp manager casually came sauntering out to greet us and exclaimed “there is an orangutan at accommodation number 8!”. With very little daylight remaining and wanting to rush, we kept our calm; slowly, quietly a few paces up from our hut was a big beautiful male orangutan up in a tree on the camp property. As we looked up at the huge figure in the tree above us, he returned our gaze briefly before fidgeting a little, tucking himself up and preparing himself for a peaceful, uninterrupted sleep! Early the next day we woke in anticipation of spectacular sighting of the huge male awakening from his slumber to start the days busy activities. So, we sat a distance away to see exactly that - our new found friend awaken and move through the trees to wherever it was he was going. Deciding not to photograph him, but rather enjoy the experience it was one of the best decisions we made other than coming to Borneo. For someone who was never a huge ‘I must see an orangutan’ fan, I now understand what all the fuss is about. You can’t quite describe spending (even a very short) time with a great ape. It was incredibly hard to say good-bye to Borneo, even after only a five day visit. It’s a well-worn cliché I know, but we will go back, sooner rather than later and it will most definitely be for longer. Well, we've spent four months in Indonesia already (time really does fly) and we cannot get enough of the energy, the spirit and the joy of the people who live here. Our small village in West Java is completely beautiful and the people are so friendly. I love everything about it; the unique and small shops, the schools, the homes and the social network (not Facebook) that all of the people have with each other here. Friends gather on a verandah, cooking and sharing food, stories and laughter. One of our many local shops - So many things tucked away! The local stores are charming and have everything you can imagine in their tiny spaces. Coffee, garlic and shampoo packets hang colourfully from the rafters and anything you cannot see is usually tucked away somewhere. Energy efficient light globes? Tidak apa-apa (No problem)! We even have a small plant nursery in the village, as everybody here takes great pride in their gardens. Children always take advantage of the warm days to take a dip. Those who know me well, know that I don’t like being around kids that much, but here in Indonesia I love being around the children; they are fun, curious and above all very grateful for any activity they do, from drawing to walks in the forest, they are always excited. We even went swimming in a beautiful clear waterhole one hot day, which I will remember forever. We ‘wagged’ book club like naughty school children and headed off into the forest stream. “Look Miss, Look Miss” they would say as they showed me proudly how they could swim. Once I felt how cold that water was, I bailed out! IT WAS FREEZING ... These kids have no feeling, I’m sure of it! 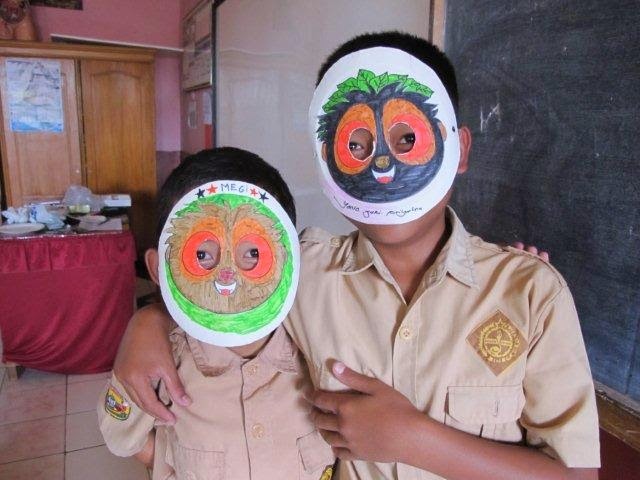 The education side of the Little Fireface Project is coming along very nicely, with weekly visits to the local schools to complete the Forest Protector pack, which are pre-planned lessons about the loris and their habitats. It is fabulous concept making a real difference in Children’s environmental education in the area. I also run the newly re-vamped “Nature Club”, an after-school ‘hands-on’ program to learn about the environment. 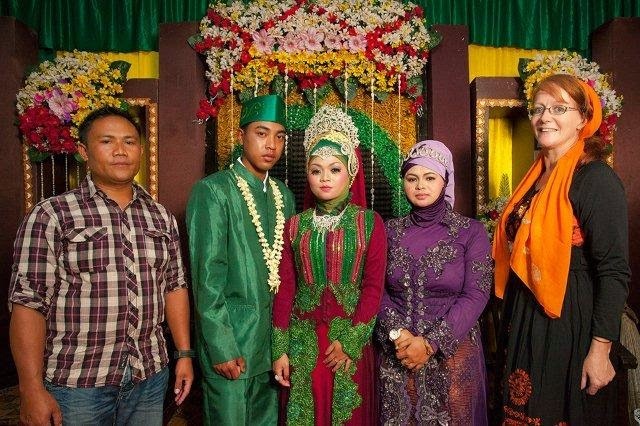 Weddings, no matter whose they are, are always colorful events. As you can probably tell, socialising is a large part of the culture here and I have been to more weddings than I care to mention ... and a circumcision. I didn’t get to see the ‘snip’ but I did get to experience the beautiful ceremony, prayers and food that followed. Truly a moving experience; with the little boy, who was six, happy and playing around all afternoon. Me and Anna getting our wedding on! The weddings are something else; a whirlwind of colour and noise. There is dancing, singing and musicians on the stage, where guests can join in. Weddings are a huge highlight in the village calendar and the families go all out to ensure the VERY full day is successful. I love the weddings and the work and pre-planning that goes into them is almost unbelievable. Dr Anna Nekaris and I took some time out and visited a bridal salon at the bottom of our village. After hours of primping and pampering we were miraculously transformed into Indonesian brides and we had a photo-shoot. Our crack team, Nea and Ariff are well known in Indonesia and have won many awards for their make-up and hair work. I think they really do work miracles, as I am no spring chicken and my photos turned out pretty good! No two days are the same in Indonesia – I LOVE IT! 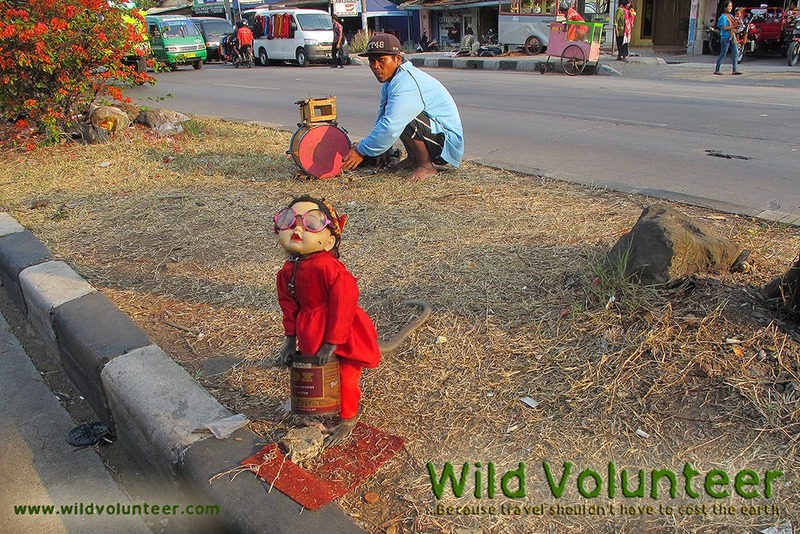 ©2013-2014 WILD VOLUNTEER ....Because travel shouldn't have to cost the earth . Awesome Inc. theme. Powered by Blogger.